Subaru will begin funding a quest for the top performing safety restraints so consumers can keep their dogs as safe as possible while riding in their cars. Subaru owners have always loved to take their dogs with them while traveling in the car, and now it will become safer for both owners and their dogs. The active lifestyle of Subaru owners has always lent itself to taking the family dog along on camping and hiking trips. Subaru recognizes that their owners love dogs and they take them along on family trips. Subaru has announced they will be partnering with the Center for Pet Safety to Test Pet Car Safety Restraints to keep those animals safe while riding in a Subaru. Subaru is stepping up in a big way and will actually help fund the research that will go into testing of pet car safety restraints. The Center for Pet Safety is a registered 501(c)(3) non-profit research and advocacy organization dedicated to companion animal and consumer safety. Currently, there are no performance standards or test protocols in the U.S. for pet travel products. 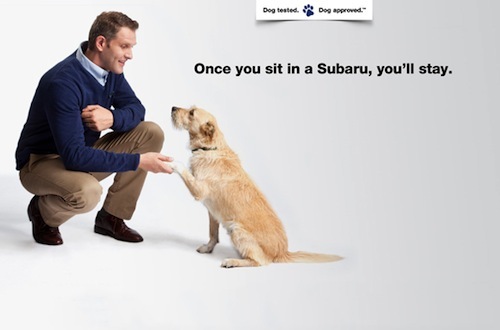 But Subaru and The Center for Pet Safety plan on changing that. The Center for Pet Safety conducts rigorous crash testing using crash dummy dogs and not live animals. A specially designed 55-pound crash dummy dog was used to see how the seat belts would hold up in a collision at 30 miles per hour. The Center tested four popular dog car harness brands, and none held up in the tests. And we could see the first laws that would require animals to wear restraints if they are riding in vehicles. Lawmakers in Subaru of America’s home state of New Jersey are the first to consider the requirement of pet restraints when riding in vehicles. Subaru will be working with the Center to develop a suitable standard for the pet restraints. Subaru has the safest vehicles on the planet for their human passengers, and they want their owners pets to be just as safe.